The Star Excursion Balance Test (SEBT) is a dynamic test that requires strength, flexibility, and proprioception. It is a measure of dynamic balance that provides a significant challenge to athletes and physically active individuals. The test can be used to assess physical performance, but can also be used to screen deficits in dynamic postural control due to musculoskeletal injuries (e.g. chronic ankle instability), to identify athletes at greater risk for lower extremity injury, as well as during the rehabilitation of orthopeadic injuries in healthy active adults. The SEBT can also be used to compare balance ability among different sports and to assess physical performance. Research has suggested to use this test as a screening tool for sport participation as well as a post-rehabilitation test to ensure dynamic functional symmetry. It has also been shown that the performance of SEBT improves after training. Before the SEBT can be performed, a small amount of setup is required. Four strips of athletic tape will need to be cut to a length of 6-8 feet each. Two pieces will be used to form a ‘+’, with the other two being placed over top to form an ‘x’ so that a star shape is formed. It is important that all lines are separated from each other by a 45° angle. The goal of the SEBT is to maintain single leg stance on one leg while reaching as far as possible with the contralateral leg . The person performing the test must maintain a their balance on one leg, while using the other leg to reach as far as possible in 8 different directions. The person (standing on his/her left leg for example) must reach in 8 different positions, once in each of the following directions: anterior, anteromedial, medial, posteromedial, posterior, posterolateral, lateral and anterolateral. The anterior, posteromedial and posterolateral directions appear to be important to identify individuals with chronic ankle instability and athletes at greater risk of lower extremity injury. When the person demonstrates a significantly decreased reach while standing on the injured limb compared to standing on the healthy limb, the Star Excursion Balance Test has highlighted his/her's loss of dynamic postural control. 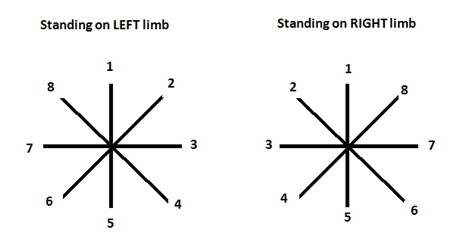 The test originally incorporated reaching in eight directions while standing on each foot, but factor analysis indicated that one reach direction in particular (posteromedial) was able to accurately identify individuals with chronic ankle instability as well as performing all eight directions. There is a similar test to the SEBT, but only utilises three directions, and is known as the 'Y-test'. There have been different studies that have investigated the evidence of the Star Excursion Balance Test. First, an overview of the reliability. The SEBT appears to be an effective means for determining reach deficits both between and within subjects with unilateral chronic ankle instability. It can also be used to determine deficits and asymmetries in individuals, as well to assist in the return to play decision-making process. To discuss the validity of this test in certain injured populations, such as patellofemoral pain syndrome, further research is still recommended. ↑ 2.0 2.1 2.2 2.3 2.4 2.5 2.6 Plisky PJ, Gorman PP, Butler RJ, Kiesel KB, Underwood FB, Elkins B. The reliability of an instrumented device for measuring components of the star excursion balance test. North American journal of sports physical therapy: NAJSPT. 2009 May;4(2):92. ↑ Pollock, Kristen M. The star excursion balance test as a predictor of lower extremity injury in high school football players. Diss. University of Toledo, 2010. ↑ 4.0 4.1 4.2 4.3 4.4 Olmsted LC, Carcia CR, Hertel J, Shultz SJ. Efficacy of the star excursion balance tests in detecting reach deficits in subjects with chronic ankle instability. Journal of athletic training. 2002 Oct;37(4):501. ↑ Plisky PJ, Rauh MJ, Kaminski TW, Underwood FB. Star Excursion Balance Test as a predictor of lower extremity injury in high school basketball players. Journal of Orthopaedic & Sports Physical Therapy. 2006 Dec;36(12):911-9. ↑ Gribble PA, Hertel J, Plisky P. Using the Star Excursion Balance Test to assess dynamic postural-control deficits and outcomes in lower extremity injury: a literature and systematic review. Journal of athletic training. 2012 May;47(3):339-57. ↑ Hardy L, Huxel K, Brucker J, Nesser T. Prophylactic ankle braces and star excursion balance measures in healthy volunteers. Journal of athletic training. 2008 Jul;43(4):347-51. ↑ Chaiwanichsiri D, Lorprayoon E, Noomanoch L. Star excursion balance training: effects on ankle functional stability after ankle sprain. JOURNAL-MEDICAL ASSOCIATION OF THAILAND. 2005 Sep;88:S90.